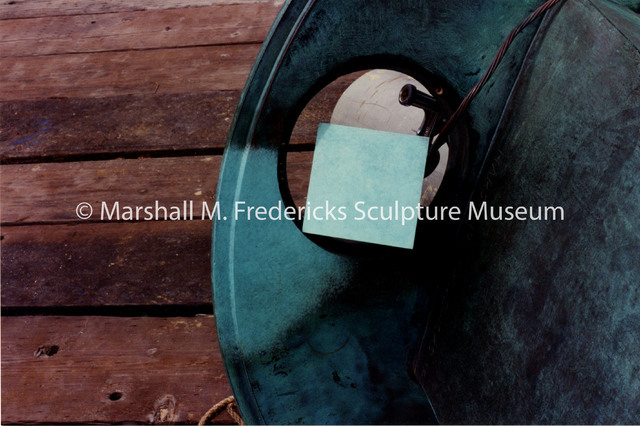 Marshall M. Fredericks Sculpture Museum | Sample of patina presented to Mr. Fredericks and a sample applied to the base for "Freedom of the Human Spirit". Both have lacquer on them. No flatting agent was mixed in the Incralac. One of four major sculptures at the Fair, the sculpture stood in the Court of States at the entrance of the U S Government Pavilion. This marked the second time Fredericks contributed a sculpture to a New York World’s Fair, as he previously exhibited a fountain at the 1939 Fair. The Freedom of the Human Spirit still stands at its original location in Flushing Meadows Corona Park in Queens borough. In 1983, Fredericks donated the design for this sculpture to his adopted hometown of Birmingham, Michigan in honor of the city’s fiftieth anniversary. Erected in Shain Park, the city financed the sculpture through generous donations from over one thousand individuals and corporations. In 2009, the city of Birmingham renovated the park and relocated the sculpture to an area in the center of the park. A small-scale casting of Freedom of the Human Spirit also serves as the annual Communications Award for the International Center for the Disabled (ICD), an organization of which Fredericks was a longtime benefactor. Unidentified photographer, “Sample of patina presented to Mr. Fredericks and a sample applied to the base for "Freedom of the Human Spirit". Both have lacquer on them. No flatting agent was mixed in the Incralac. ,” Marshall M. Fredericks Sculpture Museum, accessed April 21, 2019, http://omeka.svsu.edu/items/show/8089.